Many of the games that Canadians will find in top Microgaming sites are the same: spinning reels and winning paylines. With the Hexaline slot machine, that's not the case at all. You'll find 18 honeycomb Hexagons instead, and each one is a win waiting to happen. 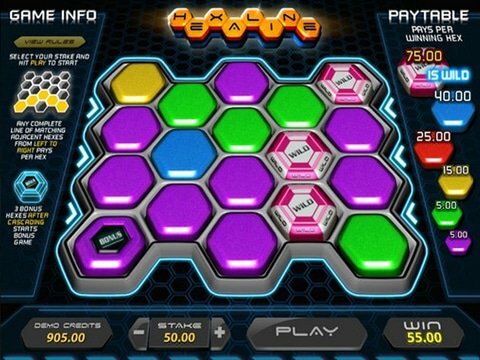 You can review it right here on this page with the Hexaline free play slot demo that is available with no download and no registration, and you can even access it from most mobile devices. The hexagons all come in different colors, and there are Wilds that are multi-colored, as well. Winning combinations are formed by lining up like colors from left to right. There's even a bonus round in which you can participate here, and the goal is to collect hexagons with gold stars by making use of the ones on the board that contain arrows. Each gold star boosts your prize, but you should watch out for those that have a red cross as these can end the game immediately. Overall, if you're a fan of trying something new, then this is definitely a great way to do it especially when its available at reputable Microgaming casinos. There are all kinds of ways to win, and there's no risk just to try it out. There aren't a lot of titles out there that allow you something so different, but if you're in the mood to escape the traditional field for something more unique - and you want to spend some real money in the process - then the Bejeweled slot machine is a great option. Here, rather than making matches solely from left to right and horizontally, you'll also win by matching gems vertically! Basically, just create a horizontal or vertical line of three matching gems, and you can win big. The top jackpot of $400,000 is pretty enticing, too.